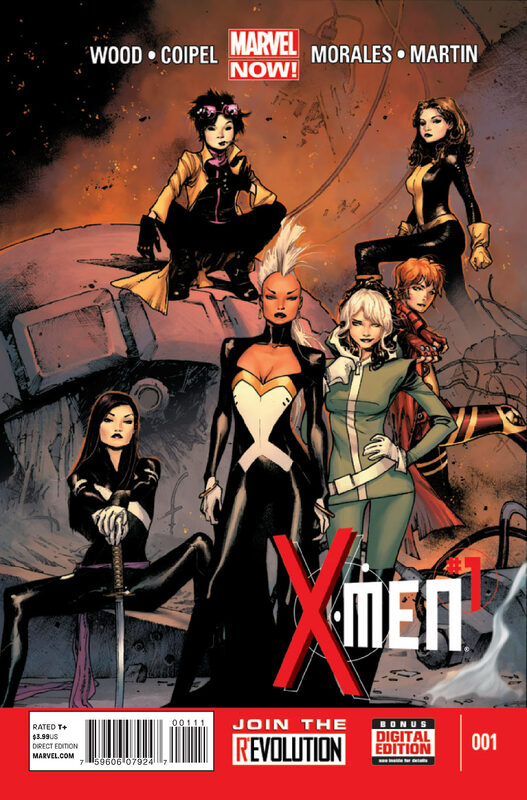 Cover- We have our all female X-men cast with Storm/ Ororo Munroe, Rogue/Anna Marie, Rachel Summers, Psylocke/Elizabeth Braddock, Jubilation Lee and Shadowcat/Katherine “kitty” Pryde all rendered in the same style as the interiors by Olivier Coipel. Everything looks pretty damn good and slick to boot. Villain- So Grant Morisson’s John Sublime makes a return and this time with evil alien sister Arkea. Can’t say I hate the potential here. School- I found the exchange between Mercury and Bling and how Storm and Rachel dealt with said situation was very well done and clearly shows a dominant side to Storm that has not been shows in a good LONG time. 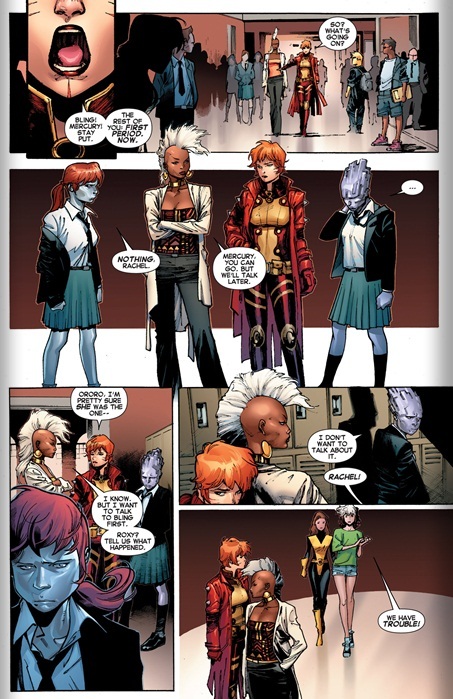 It also made me miss the simpler times of X-men Legacy which once focused on the teachers of the Jean Grey School. Hopefully the human moments like this will get a better shine under the spotlight going forward. Art- Olivier Coipel’s art is simply beautiful and smooth. His Psylocke and Storm illustrations are strongest though. 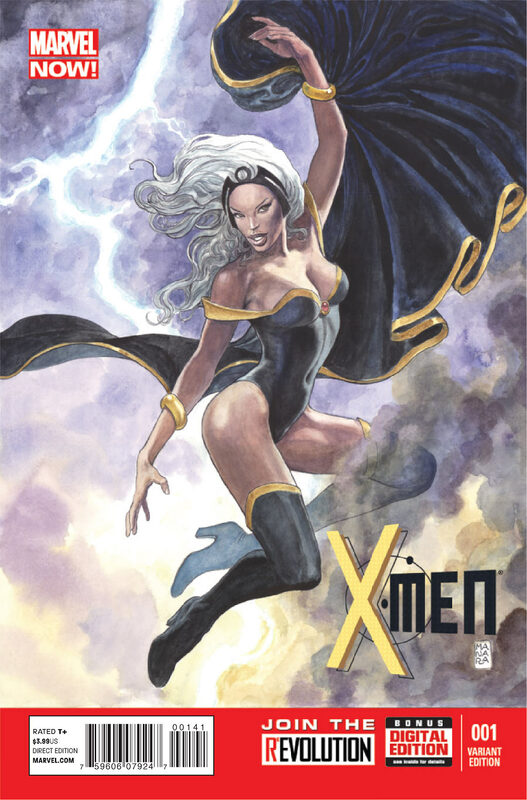 Coipel’s rendering of Storm’s costume may be the best yet! Action- Rogue totally nailed it this issue reminding me and just about everyone who lived through the 90’s fox animated series why she was so popular. The flight and super strength oh how I miss her with those kree powers. That’s all the action we get this issue but it left me wanting so much more. Family- This a powerful recurrent theme in this book as Jubilee feels a connection to this baby because of her own life as an orphan. There is also her connection to the X-men her adopted family. There is an interesting discussion that can be made about biological family and of course those who you choose to surround yourself with. Also interesting is the dichotomy of Sublime running from his biological family (his sister) and Jubilee running toward her adopted family. Diversity– In the same breath we always complain about the lack of black superheroes headlining mainstream books, though sales are always lackluster, there has also always been a shortage of other minorities; Asians, Muslims, Jews, women etc. This re-launch hits quite a few high notes in addressing this problem. Sure it’s a team book but we are getting six women headlining a mainstream book. Two of them are Asian (and no I’m not going to mention that one is a British white chick trapped in an Asian body), one is black and we have three white chicks, one of whom is a redhead (another minority I’ve heard) oh and Kitty is Jewish. Let’s also give marvel credit that this is the second book they’ve launched under the Marvel Now banner with an all female cast, the other being Fearless defenders. DC Comics New 52 should be taking notes but clearly they don’t give that much of a damn. 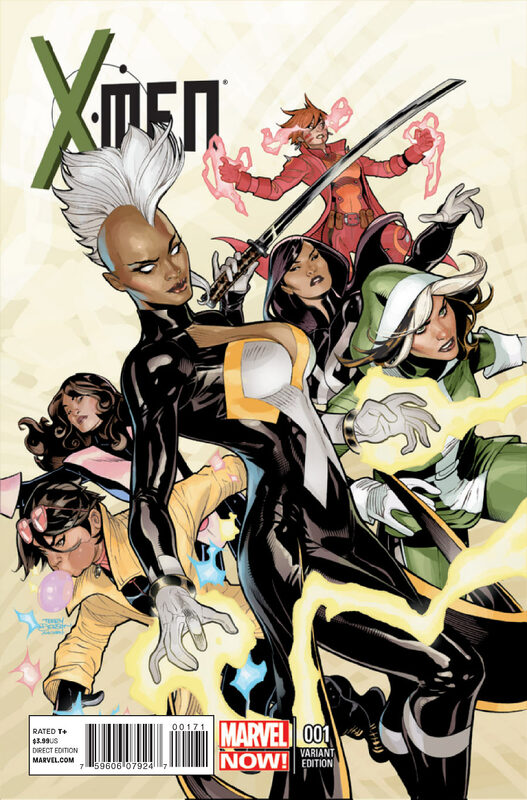 Black Heroes- Bling showed up at the start of the story and Storm had a pretty strong presence throughout. Weird– Ok now someone please explain to me how Storm could be on a train in the middle of the day and everyone pretends she’s invisible? This is where Claremont for all his now dinosaur like writing would have spun that into pure gold. Before she was married to T’challa she lead a very public X-men team which made her a celebrity, Claremont nods to this by having her hounded by Paparazzi that was before her Marriage to an African King, her stint as an Avenger and membership in the Fantastic Four. There would be major excitement having her walk through this train but the art shows her and her teammates in colorful garb not even getting so much as a wandering eye in this train. No, No, No that was all wrong on so many levels I don’t even want to get into it. Celebrity on pubic train does not = what happens in this issue. Again? –Ladies and gentlemen I give you Chris Claremont’s second worst creation ever from his failed “Revolution” X-men line debacle of the millennium, Karima Shapandar also known as the Omega Sentinel. The last time we saw her before this issue she was possessed by the marauders Male and you know what happens this issue? SHE GETS POSSESSED AGAIN! How original of a development is that? I mean they should win an Eisner award for such originality! Also under the again category is an X-man carrying around a baby who’s important to their very survival. I know my mind is shallow but didn’t Cable and Hope start out just like that? Messiah War, Messiah Complex etc? I mean you really can’t get more original than that now can we? Accessibility- Nitpick to be sure but to truly understand the gravity of having Sublime and his sister go war the reader would need to have read and understood the subtleties of Grant Morrison s entire New X-men run and witnessed Sublimes war on the mutant strain of DNA to even begin to comprehend where this story cold possibly go. It would have also been a good idea to have a small text box to explain the powers of our team the first time they get panel time. This would have helped new readers keep up with the powers and the power play dynamics present in the school scenario. Storm is headmistress and Rachel was senior staff. Small touches like that would have really enhanced everything.